A DC-based pair of bald eagles, aptly named Mr. President and First Lady, recently gave birth to two adorable chicks, offering our nation’s capitol a brief respite from the relentless chatter of bird-brained politicians. 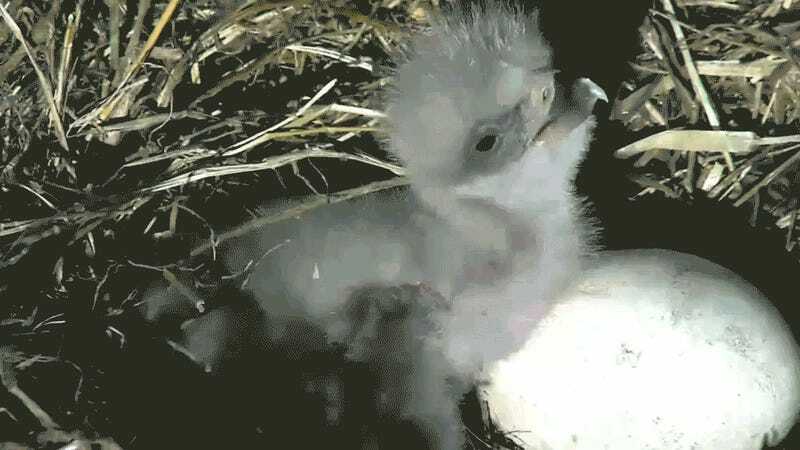 A live camera feed has allowed birdwatchers to spy on the itty white fluffballs ever since—but since ain’t nobody got time for that, National Geographic has just put together a highlight reel. The patriotic bald eagle pair had their first chick atop a tulip poplar at the National Arboretum a year ago. This prompted the installation of two live video cameras, which are jointly managed by an employee at the National Arboretum and a slew of dedicated volunteers across the US and Canada. In mid-February, First Lady laid two new eggs. The chicks, currently known as DC2 and DC3, hatched about ten days ago. They’ve been eating raw fish and providing nonstop entertainment to voyeuristic humans ever since. I wonder how many laws we’d have to re-write to get this bald eagle family on the presidential ticket. Seriously, it can’t make this election year any worse.